Jonathon Simmonds, Phil Quaife and Tarek Elgammal have ended a successful season, winning the UAE GTB Championship for 2010/2011 in the Motorsport Wheels / Alex Renner Motors Porsche GT3 Cup car. Simmonds and Elgammal collected the trophy on the teams behalf at the Night of Champions held at the Courtyard Marriott on the evening of Thursday 21st April 2011. Despite several setbacks during the season, including a back injury for Elgammal which put him out of racing for over 6 weeks, the team led by Alex Renner fought all the way to the end against the mighty Callaway Corvette of Yuri Skulla and Mohammed Al Muttawa. Simmonds was delighted with the teams achievements and thanked all of the team during a highly emotional speech at the awards ceremony. “This is very much a team sport as evidenced this season. Tarek and Phil helped immensely in getting me up to speed and I can’t thank them enough for all their hard work this season. Of course, alot of the credit has to go to Alex Renner & his team of engineers & mechanics who gave us a great car every weekend” said Simmonds. After a disrupted season due to injury, Elgammal was also full of praise for his team. “I have to thank Jon for the opportunity, I thoroughly enjoyed driving with him. To all the guys from Alex Renner Motors and Motorsport Wheels and Phil Quaife, you proved you are the best in the business & we could not have acchieved without you. A great team, it has been an absolute pleasure. 30th May, 2012 – Australian born WGA Middle East Supercar Series star driver Tarek Elgammal has completed his first laps in a current specification V8 Supercar at Australia’s Winton Raceway this week. The Dubai based racing driver, who won the inaugural Middle East Supercars Championship and who is also a former UAE GTB Champion, was given the opportunity by Tony D’Alberto’s Team Hiflex V8 Supercar team. Elgammal was hopeful that the successful test could open the door to more V8 Supercar opportunities and his consideration for international co-driver roles in the near future. Driving the same Ford Performance Racing designed and constructed FG Series Falcon V8 Supercar that Tony D’Alberto is competing with strongly this season, Elgammal impressed with his immediate pace on the tight and technical three kilometre Winton Raceway circuit. “The team were very busy as they had their normal test program to complete, as well as ensuring that their endurance race co-driver Dale Wood gained some valuable test miles in the car. So for Tony and Al D’Alberto to give me this opportunity was a great privilege and I can’t thank them enough” said Elgammal. Elgammal took over the driving duties mid-way through the test day, under the guidance of experienced series driver Tony D’Alberto and his race engineer Adam DeBorre. Speaking after the test, Elgammal was excited by his first taste of Aussie V8 Supercar power, completing the session without incident, quickly acclimatising to the car to set a number of respectable lap times. Elgammal stated, “I wasn’t going out there to break the lap record, and I was very aware of the workload Team Hiflex had on their test day so I wasn’t going to do anything silly. I had a very short window in which to learn the track and the car so the goal was to get the maximum out of that short time and I am satisfied that I did that. “These cars take a fair bit of time to understand, but the main thing was that I got in and drove it quickly and handed it back to the team in one piece. I know without doubt that with some more seat time I could go much quicker as the car didn’t intimidate me. 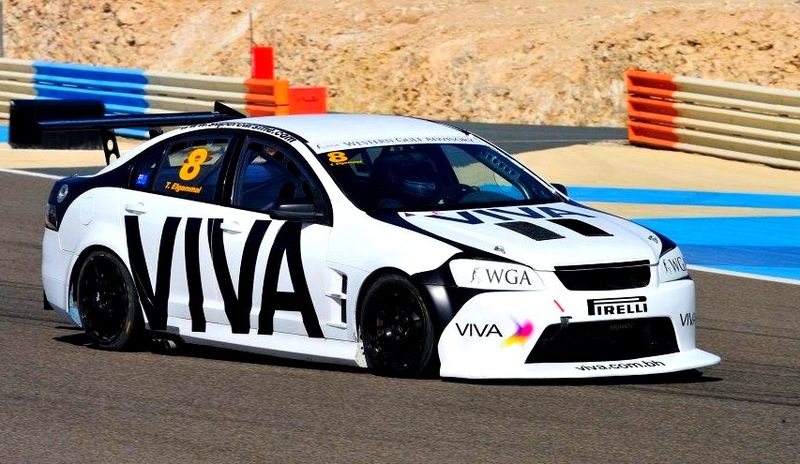 Elgammal was one of only three drivers to win races during the 2011/12 WGA Supercars Middle East Championship, competing with the VIVA Racing Team. He is planning to return to the new series, while also competing in Sportscars. VIVA Racing Team drivers Tarek Elgammal and Raed Raffii aim to finish the season on a high after a challenging round for both drivers in Bahrain. Despite making significant steps forward, both cars suffered from reliability issues and were unable to match the pace of rival Batelco team driver Alban Varutti who won both races. Prior to the previous round, only 11 points seperated the top 6 drivers in the championship, however with Varutti’s double win and most challengers problems, he has now extended his lead to a comfortable 30 points from Alba team driver Faisal Raffi with Elgammal 3rd in the championship and 31 points off the lead. The next round will be held at the Bahrain International Circuit on the 30th and 31st March 2012.